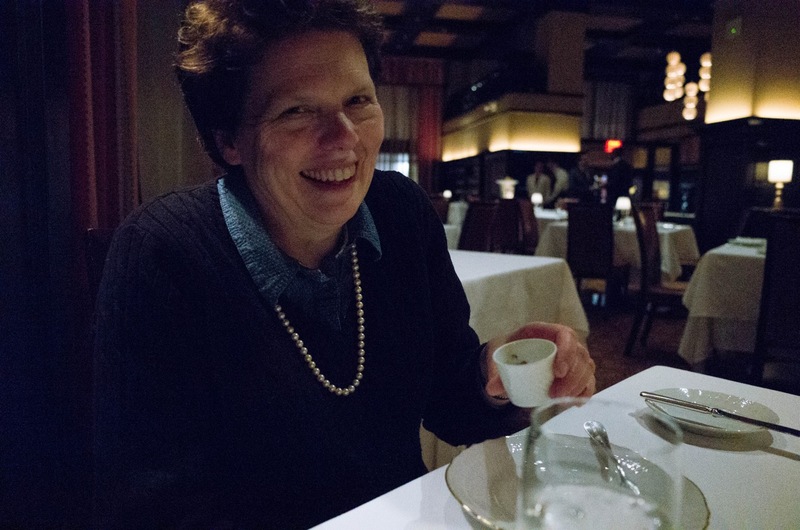 Last Thursday night (the second night they were in town) Mom and Dad and I ate at Del Posto, Mario Batali's giant next-level fine Italian dining castle on 10th Avenue. As online reviews of fancy restaurants tend to really split hairs and my last fine dining experience was such a underwhelming let down I arrived a little worried about how the meal would go and that I might wear out my restaurant picking good will with Mom and Dad. Well I've got good news and I'll tell it to you right now: dinner was grand. And mom got to use her first purse stool. 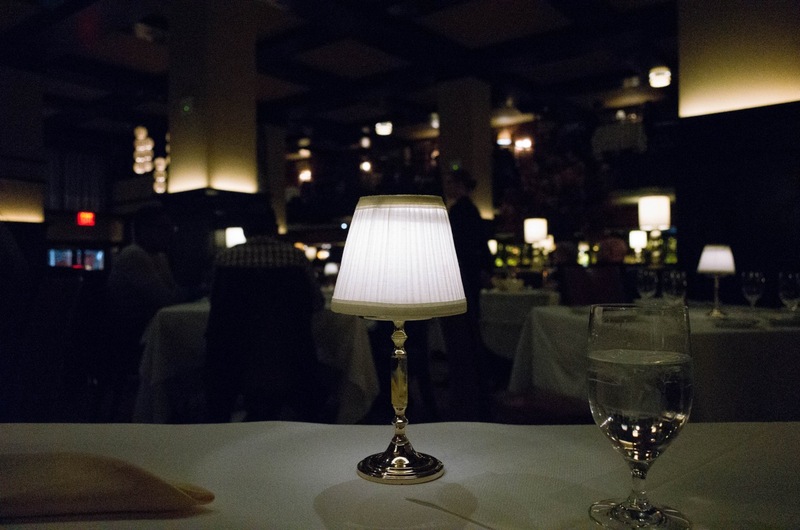 First of all, a word on the space: Del Posto is gigantic, with tons of space between each table. This is one of the tokens of fanciness: space. Thursday was one of those horribly snowy days of our late winter where the sidewalks hadn't been shoveled yet. It was a long trip of tiny shuffling steps for me to get to the restaurant from 8th avenue. 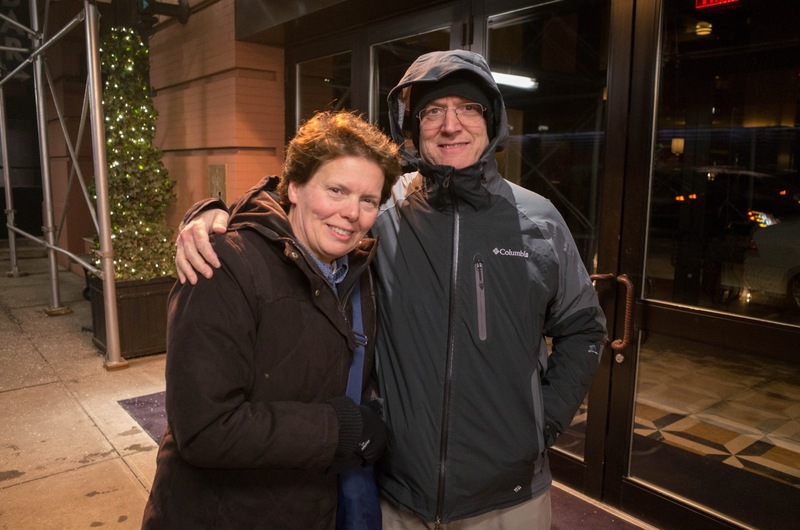 But arriving at Del Posto I stepped into the dimly lit warmth of doors being opened and coats being taken and a patient staff standing just a few feet back until they were needed or until our party was complete. We were seated in a corner of the restaurant with a good view of all the goings on. 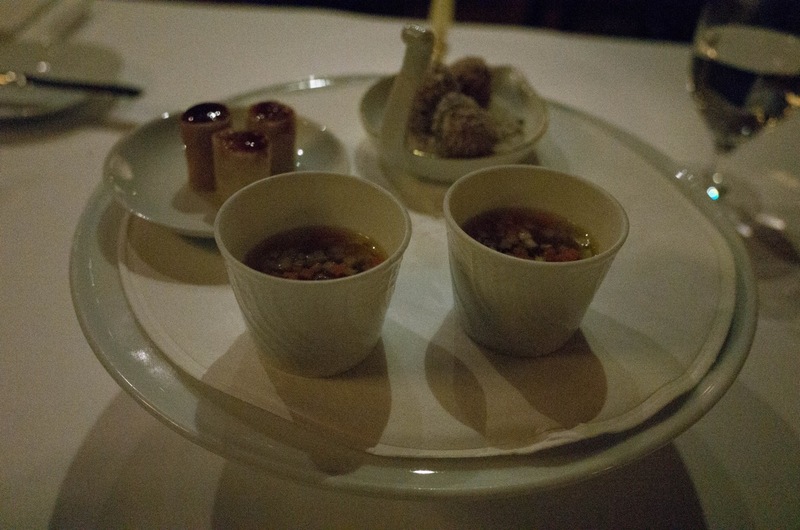 They started our meal off with some amuses, the little cups were a lentil soup, and other two things? Really I don't remember exactly what they were...the balls were daikon rolled in pepper and cheese, I believe. And the little tubes? Can't remember. I think there was something olive oily about them. 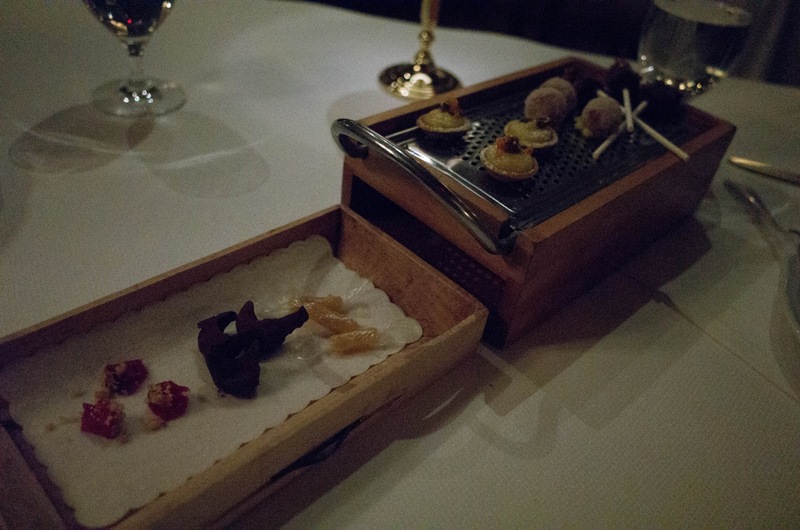 But each of these amusing little bites helped say "Hey, don't worry, you're going to like eating here." This is a picture of Mom laughing at something I said about the little lentil soup cups. 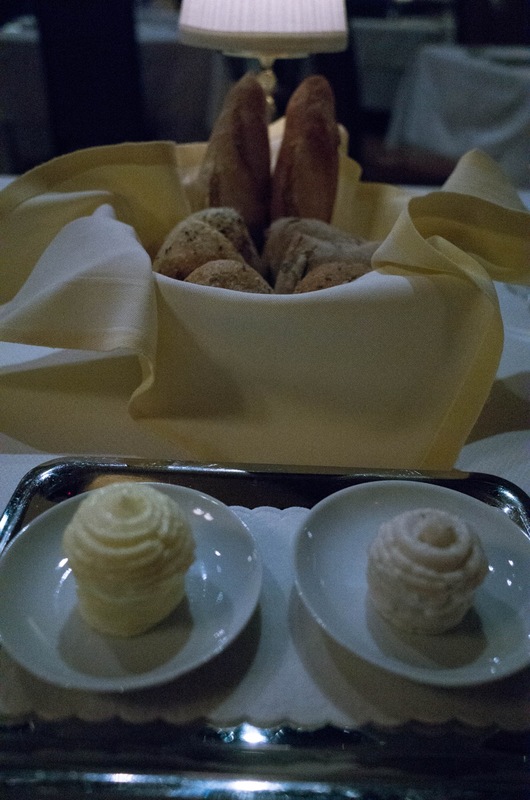 Then out came the bread basket with nice warm breads, sweet cream butter and rosemary lardo. 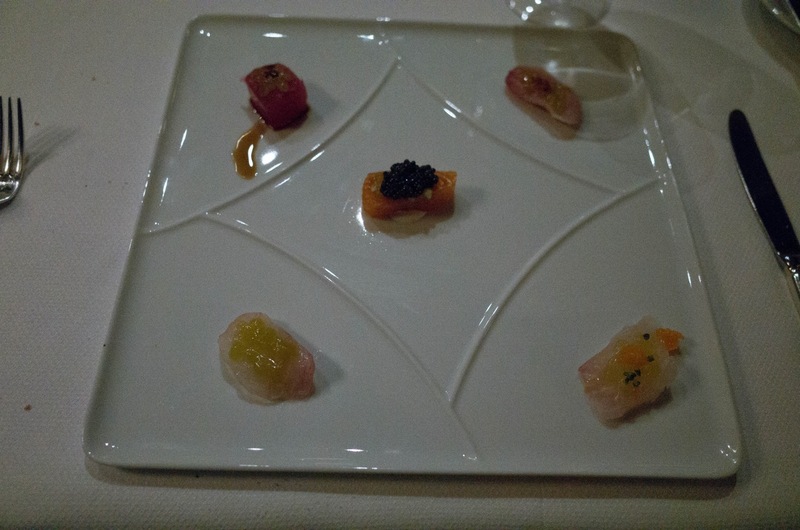 For my antipasti course I had the fin fish Crudo plate, five little bites of raw finned-fishes. Which fishes? Tuna was there, hamachi was there (isn't hamachi tuna? Dad asks, pulling out his phone to look it up on Wikipedia), Artic char was sitting in the middle with a generous dollop of Ossetia caviar sitting on top. 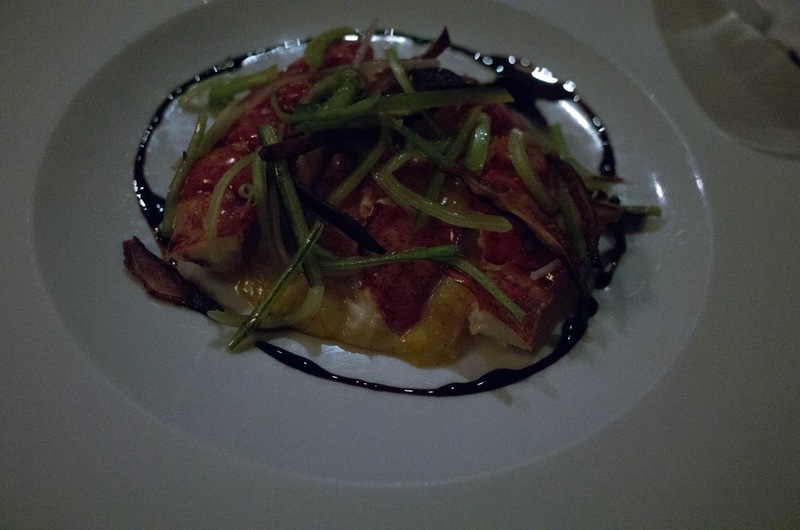 (All the other fishes had some sort of complimentary topping ontop as well). Mom had the winter salad, dad had the lobster Caesar. 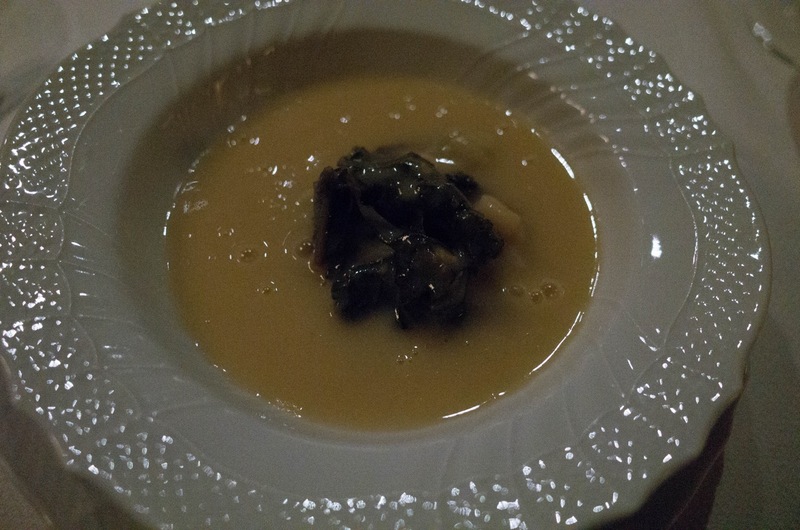 Our first pasta selection was actually a pork jowl soup they called "Lidia's Jota", probably named after someone's grandma. 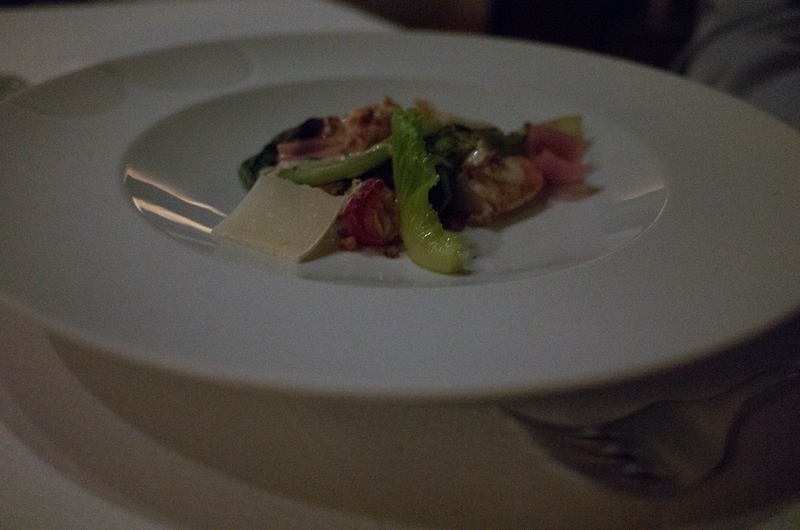 First, bowl with jowl and fermented cabbage. Next, soup added to soup. It was a very rich dish. Left us tempted to ask for seconds. 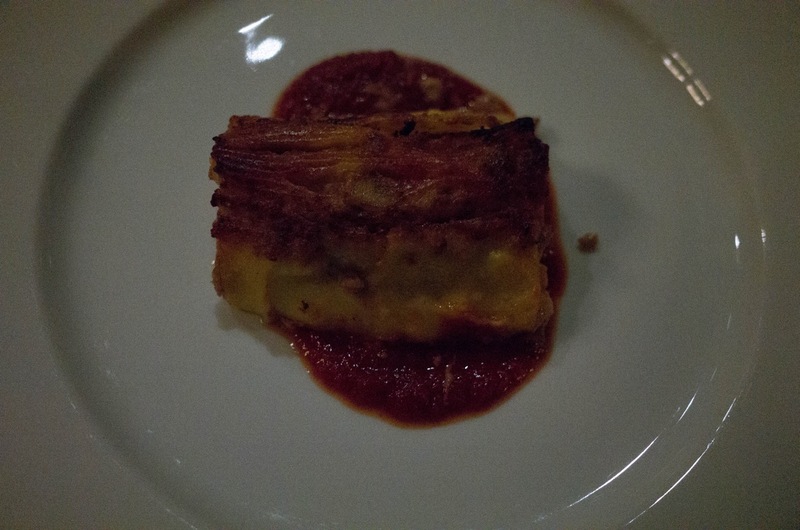 Our second pasta: a slice a piece of Del Posto's famed day old 100 layer lasagna, featuring 50 super thin layers of pasta with 50 super thin layers of meat and sauce and cheese. It really is a dish they make a day before, so the flavors can combine overnight (haven't you noticed how good leftover lasagna is?) and then they sear it before serving so each piece has the crunchiness of a corner piece. 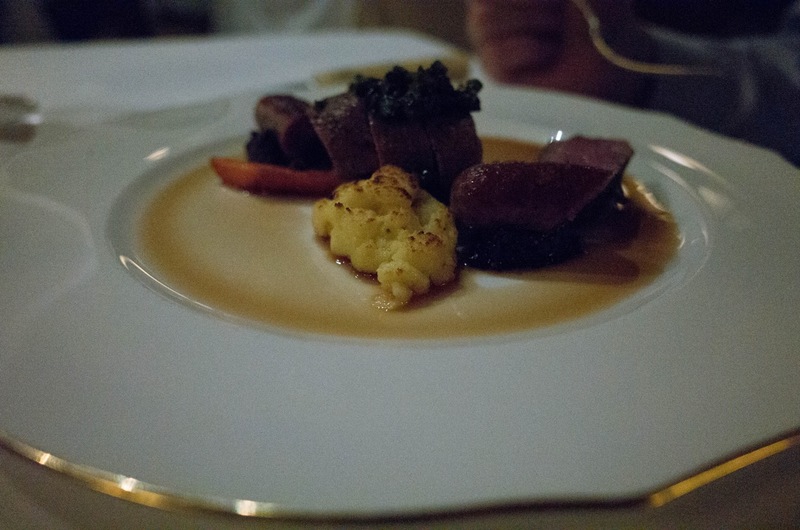 The resulting dish has a hominess and heartiness that's a playful contradiction to the elegance of the Del Posto environment. I had the poached lobster and I ate the shell because it was so soft and stuck to the meat. I think I was supposed to eat it. It was good. I was pleased with my choice. Dad had sliced lamb and lamb sausage with gnocchi romana, which I had just read the recipe for. 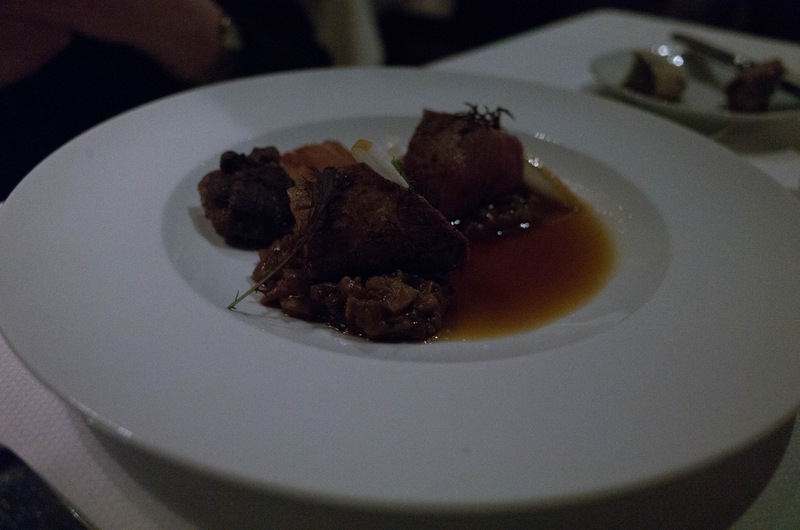 Mom ordered the "Heritage Red Wattle Trio of Pork" (maybe the cutest name I've heard given to a pig dish?) and the bite of belly I tried left me thinking Mom won with the entree picking. And then it was dessert time. 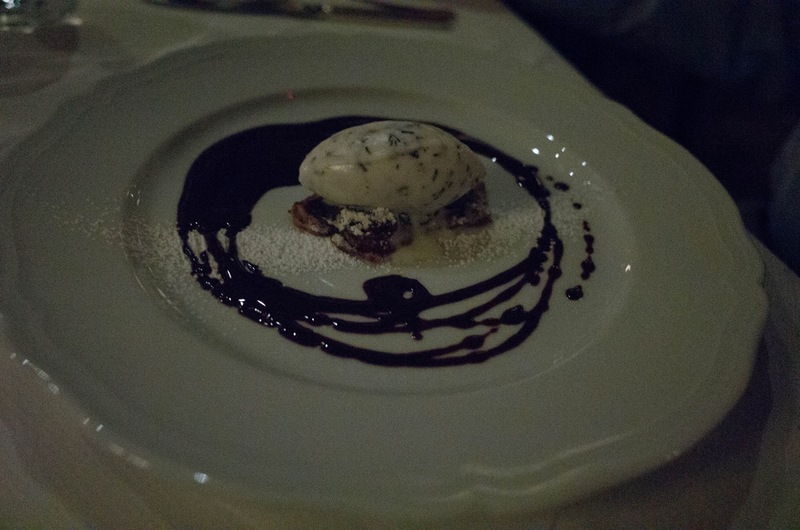 I was really looking forward to dessert because I'm a fan of Del Posto's pastry chef Brooks Headley's writing. The dessert menu was both fanciful and in Italian, so the pastry waiter was kind enough to recite and explain every offering. Very impressive. His descriptions and suggestions had me completely changing what I thought I'd order. 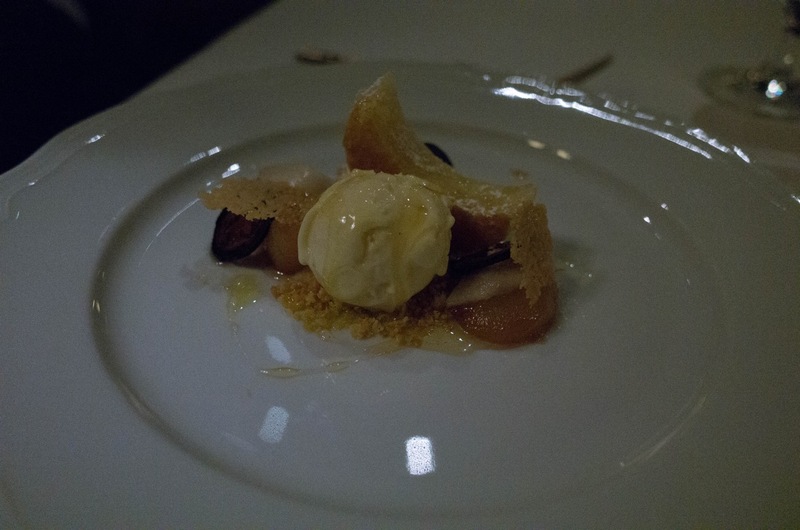 Mom had the "Pecorino Romano Cake with Honey Gelato and Roasted Pears." It was a cheesecake. She said it was very cheesey. I had the "Fette Biscottate with Cashew Butter, Stout and Chocolate" It was a biscotti party. It was amazing. 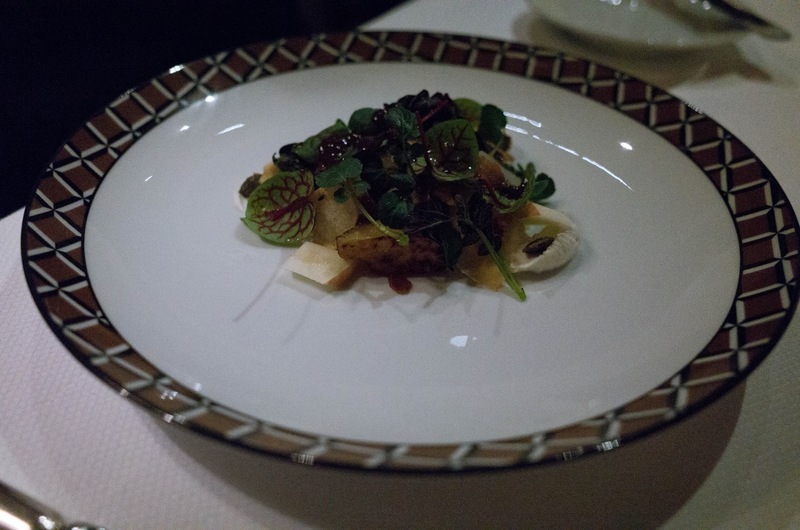 I think this was one of the fanciest things I've ever eaten. 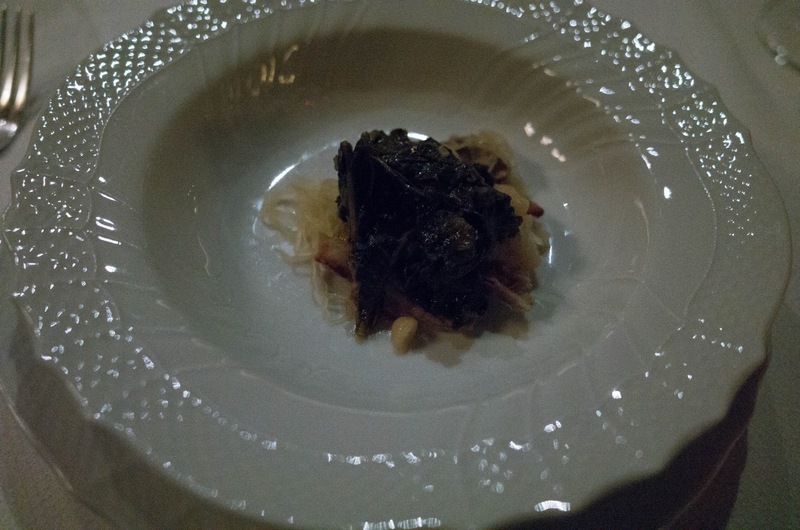 Dad got the "Melanzane e Cioccaolato with Sheep's Milk Stracciatella." It was a roasted eggplant dessert. He got it because the waiter endorsed it and to make mom laugh. And then they brought us a spread of additional little desserts...what are these called? It has a name. It sounds like "Midgard"--but that's the word Asgardians use for Earth and that's not right. 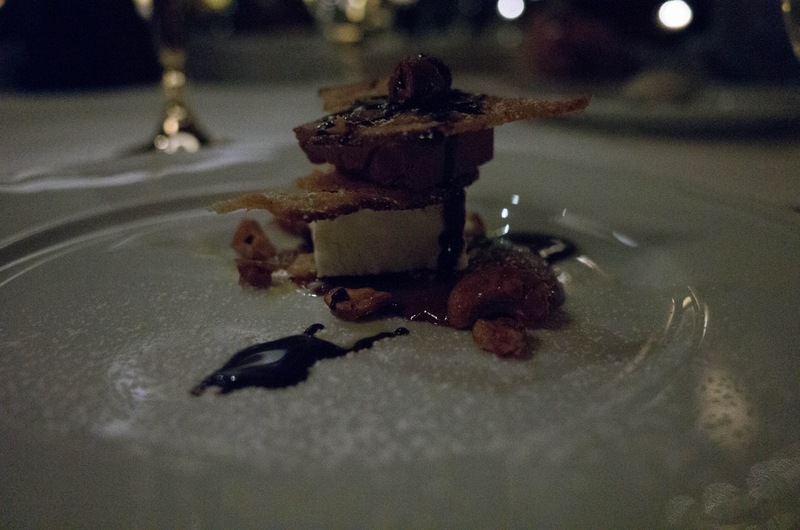 Also: they were served on a cheese grater, but we were NOT supposed to grate them all together into one dessert. Then there were little parting boxes of cookies. Of course. 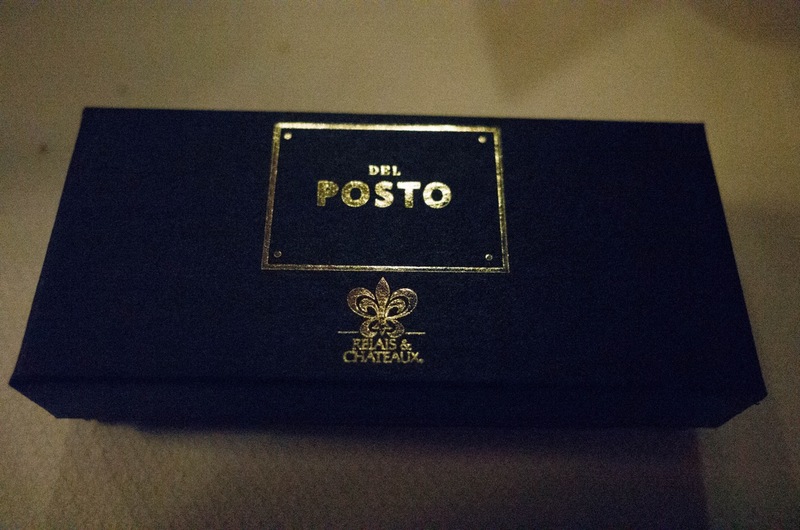 So, in sum: Del Posto was very good. I did not need to worry about it. I totally recommend it. They've got a three course lunch special and I was looking at that lunch menu and saw a lot of the food we had for dinner on it, so in my imagination, at least, I see myself returning relatively soon for the Red Wattle Pork Trio and my biscotti party. You're coming too, right?